If you’ve done the last two projects at Lowe’s, make sure you don’t miss this one! 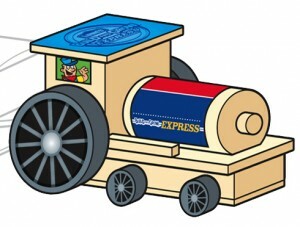 This week your child can make an adorable toy train engine for free at the Lowe’s Build and Grow Clinic. This is the final part of a three-part series. If you missed the other two projects (the caboose and train car), check at your Lowe’s store: They may have these available for purchase. The free workshop will be held on Saturday, Dec. 18 at 10 a.m. at participating Lowe’s stores. You should sign up in advance for these free workshops, and a parent must be present at the workshop with the child. Each workshop runs about an hour and is geared toward kids in first through fifth grade. Many of the projects are completed in much less than an hour. My son has gone since he was 4 and he does fine with dad’s help. They always have a blast at these workshops and it’s fun to see how proud my son is of his projects! The first 50 kids to sign up for each workshop will get a kit, work apron, and safety goggles for free. Kids also get a badge and certificate when they complete their project. Can’t make this workshop? Check out Lowe’s Build and Grow to see what other projects are being planned.